β-Amyloid protein (Aβ), the major component of neuritic plaques in Alzheimer's disease (AD), is derived from proteolytic cleavages of the amyloid precursor protein (APP) by β-site APP-cleaving enzyme 1 (BACE1) and the γ-secretase complex. BACE1 is the rate-limiting enzyme for Aβ production, and an increase in BACE1 level/activity contributes to the pathogenesis of sporadic AD. In addition to cleaving APP for Aβ generation, BACE1 plays multiple physiological roles including the regulation of synaptic functions. Here, we found that overexpression of BACE1 reduces cAMP response element binding protein (CREB) phosphorylation, protein kinase A (PKA) activity, and cAMP levels, whereas downregulation of BACE1 has the opposite effect. We showed that BACE1's effect is independent of its activity for Aβ production, which is corroborated by the observation that BACE1 transgenic mice have impaired learning/memory in the absence of neurotoxic human Aβ. Furthermore, we demonstrated that BACE1 interacts via its transmembrane domain with adenylate cyclase, resulting in reduction of cellular cAMP levels and thus PKA inactivation and reduced CREB phosphorylation. Our study suggests that in addition to its function as the β-secretase to produce Aβ, BACE1 may contribute to the memory and cognitive deficits typical of AD by regulating the cAMP/PKA/CREB pathway, which is important for memory functions. Alzheimer's disease (AD) is a devastating neurodegenerative disorder characterized by impaired memory and cognition. Ample evidence indicates that β-amyloid (Aβ) peptides play a central role in AD pathogenesis (Zhang and Xu, 2007). Aβ peptides are derived from sequential proteolytic cleavages of the amyloid precursor protein (APP) by β- and γ-secretase (Zheng and Koo, 2011). β-Site APP-cleaving enzyme 1 (BACE1), a membrane-bound aspartyl protease, was identified as the β-secretase in 1999–2000 (Vassar et al., 1999; Lin et al., 2000). Studies show that BACE1 protein levels and activity are elevated in sporadic AD brains (Yang et al., 2003), and increasing evidence reveals that BACE1 levels are upregulated under stress conditions, such as cerebral ischemia (Wen et al., 2004), hypoxia (Zhang et al., 2007), and oxidative stress (Tamagno et al., 2002), all of which are associated with increased AD incidence. Therefore, an increase in BACE1 level/activity may be vital for the pathogenesis of sporadic AD. The cAMP signaling pathway has been shown to play a crucial part in the formation of long-term memory (Lonze and Ginty, 2002). The cAMP-dependent protein kinase A (PKA), when allosterically activated by cAMP, can phosphorylate cAMP response element binding protein (CREB) at serine 133 (Gonzalez and Montminy, 1989). Phosphorylated CREB then interacts with the transcription coactivator CREB-binding protein to initiate the transcription and translation of CREB target genes, which are required for the synaptic plasticity mediating long-term memory formation. Additionally, a recent study has demonstrated that CREB enhances short-term memory by upregulating brain-derived neurotrophic factor, suggesting that CREB signaling is involved in the formation of both short- and long-term memory (Suzuki et al., 2011). CREB-mediated gene expression is impaired in the brains of both AD mouse models and patients (Phillips et al., 1991; Gong et al., 2004), as well as in cultured neurons insulted with Aβ (Tong et al., 2001). We and others have previously shown that overexpression of BACE1 in human APP transgenic mice worsens learning/memory deficits, an effect that was thought to be attributed to increased BACE1 enzymatic activity or altered levels of APP fragments including Aβ and C-terminal fragments (Rockenstein et al., 2005; Cole and Vassar, 2007). Interestingly, we also found significant learning/memory deficits in BACE1 single transgenic mice (Rockenstein et al., 2005). Since murine APP fragments are less neurotoxic than human ones (De Strooper et al., 1995), we speculate that the elevated BACE1 level per se may contribute to the impaired learning/memory in BACE1 transgenic mice. Here, we show that an elevated BACE1 protein level reduces CREB phosphorylation, PKA activity, and cAMP levels in mouse neuroblastoma N2a cells and rat primary cortical neurons, as well as in mouse brains. We also show that these effects of BACE1 are independent of BACE1 enzymatic activity and Aβ levels. Finally, we elucidate the underlying mechanism, i.e., BACE1 interacts via its transmembrane domain with adenylate cyclase to inactivate the cAMP/PKA/CREB pathway. This study reveals a novel physiological function of BACE1 and provides further understanding of the role of BACE1 in AD pathogenesis. Forskolin was obtained from Sigma-Aldrich. The antibodies used were as follows: anti-hemagglutinin (HA) tag, anti-CREB, anti-phosphorylated-CREB (Ser133), anti-postsynaptic density 95 (PSD-95) from Cell Signaling Technology; anti-adenylate cyclase from Santa Cruz Biotechnology; anti-synaptophysin, anti-β-actin from Sigma-Aldrich; anti-APP (22C11) from Millipore Bioscience Research Reagents; anti-BACE1 (3D5) provided by Dr. Robert Vassar (Northwestern University, Chicago, IL); Alexa Fluor-conjugated secondary antibodies from Invitrogen. N2a cells were maintained in a 1:1 mixture of DMEM and Opti-MEM containing 5% fetal bovine serum. APP/APLP2 double knock-out (KO) mouse embryonic fibroblast (MEF) cells were maintained in DMEM containing 10% fetal bovine serum. Primary cortical neuronal cells were prepared from embryonic day 17 (E17) rat embryos and maintained in neurobasal medium supplemented with B27 and 0.8 mm l-glutamine. Vectors expressing wild-type (WT) or mutant human BACE1 were constructed in the pcDNA3.1-HA-His vector. For transmembrane domain replacement studies, the transmembrane domain of BACE1 (amino acids 455–480) was substituted with that of nicastrin (amino acids 670–690) (Huang et al., 2010). Adeno-associated virus (AAV) vectors expressing EGFP, wild-type, and mutant human BACE1 were constructed as previously described (Lawlor et al., 2007). Brain samples were taken from BACE1 transgenic and knock-out mice as previously described (Luo et al., 2001; Rockenstein et al., 2005). For behavior tests, male BACE1 transgenic mice and littermate controls were exposed to an open-field arena. Their movements were monitored by light beam sensors, and the spontaneous activity was determined as the number of beam breaks. The total activity was recorded in a 10 min block over 3 consecutive days, and 48 h later a single 10 min block was run. The total activity from each day was compared, and higher activity levels (more exploratory) on the final day implied that the mouse did not recall being in the arena. Animal protocols were approved by the Animal Research Committee at Sanford-Burnham Medical Research Institute. Western blots were performed as previously described (Chen et al., 2009). The intensity of the blots was quantitated using ImageJ software (National Institutes of Health). PKA activity, cAMP levels, and BACE1 activity assays. Commercial kits were used to assess PKA activity (Enzo Life Sciences), cAMP levels (Biovision), and BACE1 activity (Sigma-Aldrich) according to the manufacturer's instructions. All data are presented as mean ± SEM. For statistical comparison, the Student's t test in Microsoft Excel was used. A p value <0.05 was considered to be statistically significant. CREB plays an important role in memory formation, so we investigated whether BACE1 modulates the function of CREB. Upon overexpression of human BACE1 in mouse neuroblastoma N2a cells, we found that the levels of phosphorylated CREB were significantly reduced (Fig. 1A). In addition, we infected rat primary cortical neurons with AAV-expressing human BACE1 and found that the levels of phosphorylated CREB and two synaptic markers, PSD-95 and synaptophysin, were significantly reduced upon BACE1 overexpression (Fig. 1B), indicating that BACE1 overexpression also reduces the phosphorylation of CREB in neurons. BACE1 regulates CREB phosphorylation. A, N2a cells were transfected with a control or human BACE1 vector. Cell lysates were immunoblotted for total and phosphorylated CREB. AU, Arbitrary units. **p < 0.01. n = 3. B, Primary neurons were infected with AAV-EGFP or AAV-BACE1. Cell lysates were immunoblotted for total and phosphorylated CREB, PSD-95, and synaptophysin (Syn). **p < 0.01. n = 3. C, Brain lysates from BACE1 transgenic (Tg) mice (n = 3) and WT littermate controls (n = 3) were analyzed for total and phosphorylated CREB and synaptic markers. **p < 0.01. D, Brains from BACE1 Tg mice (n = 3) and WT littermate controls (n = 3) were analyzed by immunohistochemistry for phosphorylated CREB. Top, Hippocampus, 20×; bottom, cortex, 20×. *p < 0.05; **p < 0.01. E, Brains from BACE1 Tg mice (n = 3) and WT littermate controls (n = 3) were analyzed by immunofluorescence for PSD-95 (green) and synaptophysin (red). Top, Hippocampus, 10×; bottom, hippocampus, 40×. *p < 0.05; **p < 0.01. F, Brain lysates from BACE1 KO mice (n = 3) and WT littermate controls (n = 3) were analyzed for total and phosphorylated CREB and synaptic markers. *p < 0.05; **p < 0.01. We further examined the levels of phosphorylated CREB in the brains of both BACE1 transgenic and BACE1 knock-out mice. In BACE1 transgenic mice, the levels of phosphorylated CREB, PSD-95, and synaptophysin were dramatically decreased (Fig. 1C). Consistently, immunostaining for phosphorylated CREB showed significantly lower immunoreactivity in the BACE1 transgenic mouse brains (Fig. 1D). In addition, immunofluorescence assays revealed decreased levels of PSD-95 and synaptophysin in the hippocampus of BACE1 transgenic mouse brains (Fig. 1E). In BACE1 knock-out mice, the levels of phosphorylated CREB were significantly increased; however, the levels of PSD-95 and synaptophysin were slightly decreased (Fig. 1F). Together, these results suggest that overexpression of BACE1 reduces CREB phosphorylation, whereas downregulation of BACE1 has the opposite effect. Activation of CREB via phosphorylation at serine residue 133 can be mediated by PKA (Gonzalez and Montminy, 1989), so we investigated whether BACE1 regulates PKA activity. N2a cells transfected with human BACE1 were analyzed using an in vitro PKA assay. We found that PKA activity was significantly decreased in a dose-dependent manner upon BACE1 overexpression (Fig. 2A). Since PKA can be activated by cAMP, we studied whether BACE1 overexpression affects cAMP levels. We found that BACE1 overexpression also significantly decreased cAMP levels in a dose-dependent manner in N2a cells (Fig. 2A). We then examined PKA activity and cAMP levels in primary neurons infected with AAV-BACE1 and found that, similar to the results from N2a cells, BACE1 overexpression decreased both PKA activity and cAMP levels in neurons (Fig. 2B). 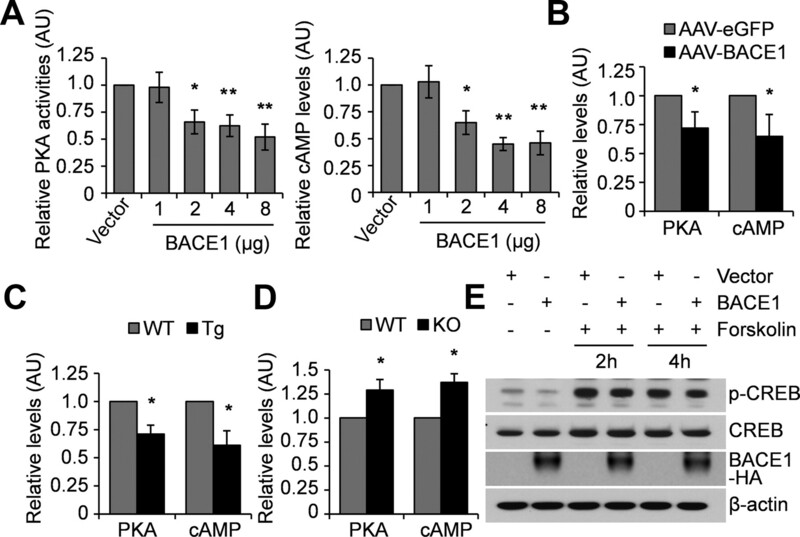 BACE1 regulates cAMP levels and PKA activity. A, N2a cells were transfected with a control or human BACE1 vector at different doses. Cell lysates were analyzed for PKA activity and cAMP levels. Data were normalized to control cells (set as one arbitrary unit). *p < 0.05; **p < 0.01. n = 3. B, Primary neurons were infected with AAV-EGFP or AAV-BACE1. Cell lysates were analyzed for PKA activity and cAMP levels. *p < 0.05. n = 3. C, Brain lysates from BACE1 transgenic (Tg) mice (n = 3) and WT littermate controls (n = 3) were analyzed for PKA activity and cAMP levels. *p < 0.05. D, Brain lysates from BACE1 KO mice (n = 3) and WT littermate controls (n = 3) were analyzed for PKA activity and cAMP levels. *p < 0.05. E, N2a cells transfected with a control or BACE1 vector for 48 h were treated with forskolin at 10 μm for 2 or 4 h. Cell lysates were immunoblotted for total and phosphorylated CREB. We also examined the PKA activity and cAMP levels in wild-type and BACE1 transgenic or knock-out mice. The results were consistent with the in vitro observations, showing that the PKA activity and cAMP levels were lower and higher in BACE1 transgenic and knock-out mice, respectively, when compared with those in wild-type mice (Fig. 2C,D). Together, these results suggest that BACE1 regulates PKA activity and cAMP levels in vivo. Additionally, BACE1 failed to reduce CREB phosphorylation when PKA was activated by forskolin, a potent PKA stimulator (Fig. 2E), suggesting that BACE1's effect on CREB phosphorylation is mediated by PKA activity. These results indicate that BACE1 regulates CREB phosphorylation via the cAMP/PKA signaling pathway. Aβ has been reported to inactivate the cAMP/PKA/CREB pathway (Tong et al., 2001). To confirm that BACE1's effect on CREB phosphorylation is not mediated through altered Aβ levels, we overexpressed human BACE1 in APP/APLP2 double knock-out mouse MEF cells, which are not supposed to produce Aβ, and found that BACE1 still reduced the level of phosphorylated CREB to a similar degree as in wild-type cells (Fig. 3A). The effect of BACE1 is independent of Aβ levels. A, WT or APP/APLP2 double KO (dKO) MEF cells were transfected with a control or human BACE1 vector. Cell lysates were immunoblotted for total and phosphorylated CREB. **p < 0.01. n = 3. B, C, N2a cells were transfected with a control, BACE1 or mutant BACE1 D93A vector. Cell lysates were either immunoblotted for total and phosphorylated CREB (B) or analyzed for PKA activity and cAMP levels (C). *p < 0.05; **p < 0.01. n = 3. D, E, Primary neurons were infected with AAV-EGFP, AAV-BACE1, or AAV-mutant BACE1 (AAV-D93A). Cell lysates were either immunoblotted for total and phosphorylated CREB (D) or analyzed for PKA activity and cAMP levels (E). *p < 0.05; **p < 0.01. n = 3. F, At 4 months of age, BACE1 transgenic (Tg) mice (n = 8) and WT controls (n = 8) were evaluated in an open-field test. The total activity upon re-exposure on day 5 was compared with that during first exposure on day 1. *p < 0.05. BACE1 contains two aspartic protease active site motifs, DTGS at residues 93–96 and DSGT at residues 289–292, and mutation of either aspartic acid residue inactivates the enzyme (Bennett et al., 2000). To further confirm that BACE1's effect is Aβ independent, we mutated Asp 93 to Ala (D93A) to generate a catalytic inactive form of BACE1. In vitro BACE1 activity assays confirmed that the mutant BACE1 had no enzymatic activity (data not shown). We overexpressed the mutant BACE1 in N2a cells and found that it reduced the levels of phosphorylated CREB, PKA activity, and cAMP levels significantly, as did wild-type BACE1 (Fig. 3B,C). We further infected primary neurons with AAV-expressing mutant BACE1 and found that mutant BACE1 significantly reduced the levels of phosphorylated CREB, PKA activity, and cAMP (Fig. 3D,E). Together, these results suggest that the effect of BACE1 on CREB phosphorylation is independent of its enzymatic activity and Aβ levels. We have previously reported impaired learning/memory in BACE1 single transgenic mice, which have no toxic human APP fragments, using the Morris water maze test (Rockenstein et al., 2005). This indicates that the increased BACE1 protein level per se may directly contribute to the learning/memory deficits. Here, we performed another behavioral experiment, the open-field test, which is commonly used to assess anxiety but is also useful for evaluation of learning/memory. We found that wild-type mice showed decreased total activity upon re-exposure on the final test day compared with their first exposure, indicative of normal learning/memory ability. In contrast, BACE1 transgenic mice did not show a significant decrease in total activity upon re-exposure (Fig. 3F), suggesting that BACE1 transgenic mice have impaired learning/memory, which is consistent with our previous finding. cAMP is synthesized from ATP by adenylate cyclase, so we investigated whether BACE1 interacts with adenylate cyclase to affect cAMP synthesis. Through co-immunoprecipitation studies, we found that BACE1 interacted with adenylate cyclase in N2a cells overexpressing both adenylate cyclase and wild-type or mutant BACE1 (Fig. 4A). Furthermore, we showed that endogenous BACE1 and adenylate cyclase interacted with each other in N2a cells (data not shown) and in wild-type mouse brains (Fig. 4B). These data suggest that BACE1 may interact with adenylate cyclase to modulate its enzymatic activity for cAMP synthesis. BACE1 interacts via its transmembrane domain with adenylate cyclase. A, N2a cells were cotransfected with adenylate cyclase (AC) and with wild-type or mutant BACE1 (D93A). Cell lysates were immunoprecipitated with mouse IgG (mIgG), rabbit IgG (rIgG), HA, or AC antibodies, and immunoblotted with HA or AC antibodies. B, Wild-type mice brain lysates were immunoprecipitated with rabbit rIgG, BACE1, or AC antibodies, and immunoblotted with BACE1 or AC antibodies. C, N2a cells were cotransfected with AC and wild-type BACE1 or BACE1 carrying the nicastrin transmembrane domain (BACE1-N). Cell lysates were immunoprecipitated with mIgG, rIgG, HA, or AC antibodies, and immunoblotted with HA or AC antibodies. D, E, N2a cells were transfected with a control, wild-type BACE1, or BACE1-N vector. Cell lysates were either immunoblotted for total and phosphorylated CREB (D) or were analyzed for PKA activity and cAMP levels (E). *p < 0.05; **p < 0.01. n = 3. Since both BACE1 and adenylate cyclase are transmembrane proteins, we next asked whether the transmembrane domain of BACE1 is responsible for its interaction with adenylate cyclase. To address this question, we replaced the transmembrane domain of BACE1 with that of nicastrin, a component of the γ-secretase complex, which is a type I transmembrane protein and does not interact with adenylate cyclase (Huang et al., 2010). In vitro BACE1 activity assays revealed that replacement of the BACE1 transmembrane domain did not affect BACE1 enzymatic activity (data not shown). We overexpressed adenylate cyclase and BACE1 carrying the nicastrin transmembrane domain in N2a cells and found that replacement of the BACE1 transmembrane domain resulted in the loss of interaction between BACE1 and adenylate cyclase (Fig. 4C). In addition, overexpression of BACE1 with the transmembrane domain replacement failed to reduce levels of CREB phosphorylation, PKA activity, and cAMP in N2a cells (Fig. 4D,E). It is worth noting that BACE1 carrying the nicastrin transmembrane domain still has enzymatic activity that can cleave APP to produce Aβ. However, overexpression of this BACE1 in N2a cells did not affect CREB phosphorylation, indicating that the murine Aβ is less toxic and may not inhibit the cAMP/PKA/CREB pathway. 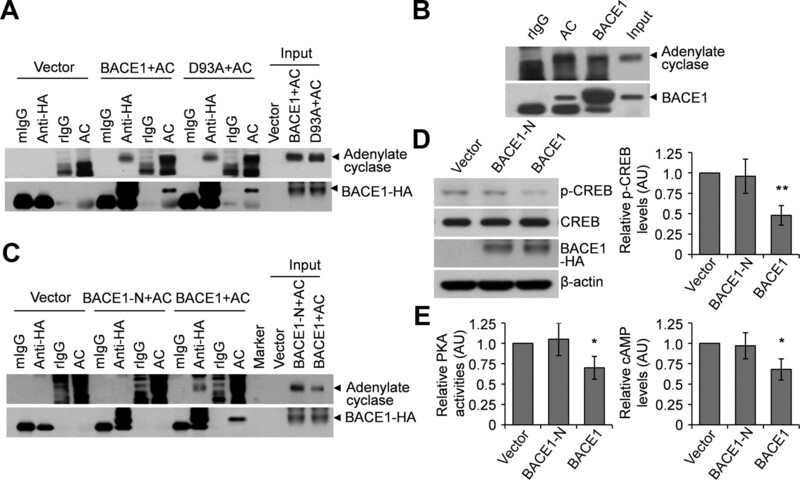 Together, these data suggest that the transmembrane domain of BACE1 is required for its interaction with adenylate cyclase to regulate the downstream signaling pathway. The precise mechanisms that lead to neurodegeneration in AD are not fully understood. Abundant evidence suggests that the altered processing of APP, which results in Aβ accumulation, is the central event in the pathogenesis of AD. BACE1 is the major neuronal β-secretase and the initiating and rate-limiting enzyme for Aβ production (Cai et al., 2001). 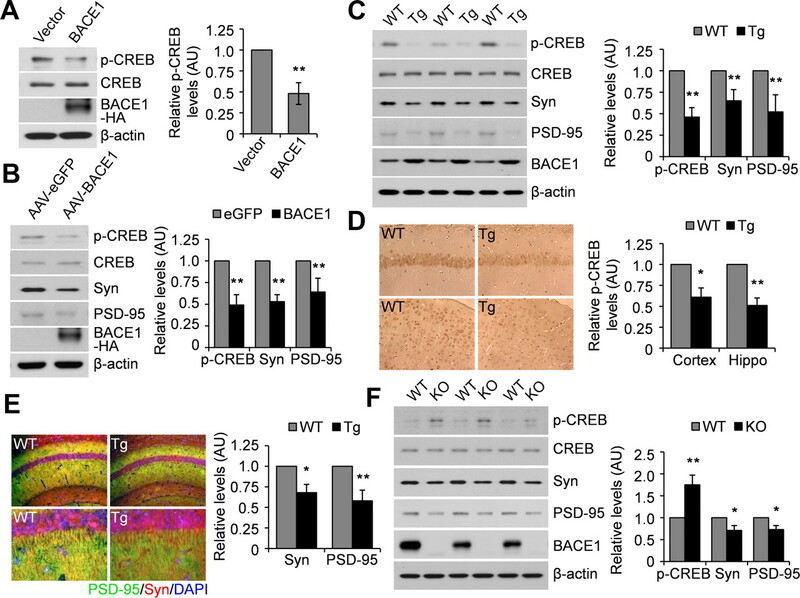 The elevated protein levels and enzymatic activity of BACE1 in AD brains led to increased β-cleavage of APP and Aβ production, suggesting that BACE1 contributes significantly to AD pathogenesis and could be a useful therapeutic target for AD treatment. This notion is supported by the findings that deletion or inhibition of BACE1 prevents amyloid pathology and cognitive deficits in APP transgenic mice (Luo et al., 2001; Fukumoto et al., 2010). In the present study, we provide data showing that in addition to its function as the β-secretase in triggering Aβ production, BACE1 can also interact with adenylate cyclase to inactivate the downstream cAMP/PKA/CREB pathway, which is independent of BACE1 enzymatic activity and Aβ levels. Therefore, our study demonstrates the inactivation of the cAMP/PKA/CREB pathway via BACE1–adenylate cyclase interaction as a new mechanism by which BACE1 may contribute to AD pathogenesis and further validates BACE1 as a prime target for therapeutic intervention against AD. The cAMP/PKA/CREB pathway has been well documented as being required for synaptic plasticity and memory formation. Inhibition of the cAMP/PKA/CREB pathway is at least partially responsible for learning and memory deficits in AD. Therefore, strategies to enhance this pathway have potential in AD treatment. The impairment of the cAMP/PKA/CREB pathway in AD has mainly been attributed to Aβ toxicity (Tong et al., 2001). Although our study does not discount the important effects of Aβ on this pathway, we show that the cAMP/PKA/CREB pathway can also be inactivated by elevated BACE1 protein levels. In addition, BACE1 single transgenic mice were found to exhibit impaired learning/memory in the absence of the neurotoxic human Aβ. Together, our results suggest an Aβ-independent mechanism for the impairment of the cAMP/PKA/CREB pathway, which may contribute to the learning/memory deficits in AD. BACE1 has been shown to process a number of other substrates in addition to APP, including APP homologs APLP1 and APLP2, low-density lipoprotein receptor-related protein, neuregulin 1, neuregulin 3, α-2,6-sialyltransferase, and voltage-gated sodium channel β-subunits. The fact that BACE1 has a broad substrate spectrum implies that BACE1 may exert a multitude of functions in regulating physiological processes. Indeed, it has been reported that BACE1-deficient mice show schizophrenia-like behaviors, severe seizures and emotional abnormalities (Laird et al., 2005; Kobayashi et al., 2008; Savonenko et al., 2008). Moreover, BACE1-deficient mice exhibit impaired hippocampal synaptic plasticity and memory performance (Harrison et al., 2003; Laird et al., 2005), suggesting that BACE1 is essential for hippocampal memory processes under normal conditions. Here we show that BACE1 deficiency activates the cAMP/PKA/CREB pathway. However, the levels of synaptic proteins are decreased, suggesting that BACE1 deficiency can impair synaptic plasticity through other signaling pathways that overtake the beneficial effect of the cAMP/PKA/CREB pathway on synapses. The fact that BACE1 has numerous substrates also raises the possibility that BACE1 may contribute to the impairment of learning/memory in AD through these substrates. However, since it has been well documented that the cAMP/PKA/CREB pathway is crucial for memory formation and our data clearly show that BACE1 interacts with adenylate cyclase and inactivates the downstream cAMP/PKA/CREB pathway, it is plausible to conclude that BACE1 may contribute to memory deficits in AD by regulating this pathway. 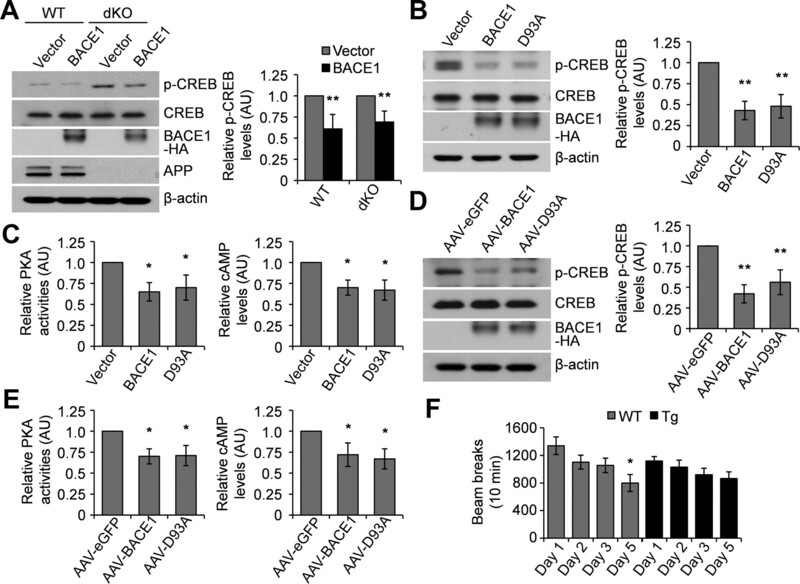 Although BACE1 has vital functions under normal physiological conditions, its elevated protein levels and the resulting increased enzymatic activity during pathological aging and under stress conditions may initiate AD pathogenesis through both Aβ-dependent and Aβ-independent pathogenic mechanisms. Therefore, normalizing dysregulated BACE1 activity and expression levels may be of equal importance for AD treatment. This work was supported by National Institutes of Health Grants R01AG021173, R01NS046673, R01AG030197, R01AG038710, and R03AG034366 to H.X., R01AG018840, R01AG022074, and R01NS057096 to E.M., and R21AG038968 to Y.-w.Z. ; and grants from the Alzheimer's Association (to H.X. and Y.-w.Z. ), the American Health Assistance Foundation (to H.X. ), National Natural Science Foundation of China (30973150 and 81161120496 to Y.-w.Z. ), the 973 Prophase Project (2010CB535004 to Y.-w.Z. ), and Natural Science Foundation of Fujian Province of China (2009J06022 to Y.-w.Z. and 2010J01233 to H.X.). Y.-w.Z. is supported by the Program for New Century Excellent Talents in Universities, the Fundamental Research Funds for the Central Universities, and Fok Ying Tung Education Foundation. We thank Dr. Robert Vassar for providing the 3D5 antibody; Drs. Daniel R. Storm and Guy C.-K. Chan for providing the adenylate cyclase vector; Dr. Young-don Kwak, Robert C. Thompson, and Traci F. Newmeyer for technical assistance; and Carolina Ceballos-Diaz and Awilda Rosario for generating the adeno-associated virus (AAV) vectors. (2000) A furin-like convertase mediates propeptide cleavage of BACE, the Alzheimer's β-secretase. J Biol Chem 275:37712–37717. (2001) BACE1 is the major β-secretase for generation of Aβ peptides by neurons. Nat Neurosci 4:233–234. (2009) Antidiabetic drug metformin (GlucophageR) increases biogenesis of Alzheimer's amyloid peptides via up-regulating BACE1 transcription. Proc Natl Acad Sci U S A 106:3907–3912. (2007) The Alzheimer's disease β-secretase enzyme, BACE1. Mol Neurodegener 2:22. (1995) Production of intracellular amyloid-containing fragments in hippocampal neurons expressing human amyloid precursor protein and protection against amyloidogenesis by subtle amino acid substitutions in the rodent sequence. EMBO J 14:4932–4938. (2010) A noncompetitive BACE1 inhibitor TAK-070 ameliorates Aβ pathology and behavioral deficits in a mouse model of Alzheimer's disease. J Neurosci 30:11157–11166. (2004) Persistent improvement in synaptic and cognitive functions in an Alzheimer mouse model after rolipram treatment. J Clin Invest 114:1624–1634. (2003) BACE1 (β-secretase) transgenic and knockout mice: identification of neurochemical deficits and behavioral changes. Mol Cell Neurosci 24:646–655. (2010) The Rps23rg gene family originated through retroposition of the ribosomal protein s23 mRNA and encodes proteins that decrease Alzheimer's β-amyloid level and tau phosphorylation. Hum Mol Genet 19:3835–3843. (2008) BACE1 gene deletion: impact on behavioral function in a model of Alzheimer's disease. Neurobiol Aging 29:861–873. (2005) BACE1, a major determinant of selective vulnerability of the brain to amyloid-β amyloidogenesis, is essential for cognitive, emotional, and synaptic functions. J Neurosci 25:11693–11709. (2007) Novel rat Alzheimer's disease models based on AAV-mediated gene transfer to selectively increase hippocampal Aβ levels. Mol Neurodegener 2:11. (2000) Human aspartic protease memapsin 2 cleaves the β-secretase site of β-amyloid precursor protein. Proc Natl Acad Sci U S A 97:1456–1460. (2002) Function and regulation of CREB family transcription factors in the nervous system. Neuron 35:605–623. (2001) Mice deficient in BACE1, the Alzheimer's β-secretase, have normal phenotype and abolished β-amyloid generation. Nat Neurosci 4:231–232. (1991) BDNF mRNA is decreased in the hippocampus of individuals with Alzheimer's disease. Neuron 7:695–702. (2005) High β-secretase activity elicits neurodegeneration in transgenic mice despite reductions in amyloid-β levels: implications for the treatment of Alzheimer disease. J Biol Chem 280:32957–32967. (2008) Alteration of BACE1-dependent NRG1/ErbB4 signaling and schizophrenia-like phenotypes in BACE1-null mice. Proc Natl Acad Sci U S A 105:5585–5590. (2011) Upregulation of CREB-mediated transcription enhances both short- and long-term memory. J Neurosci 31:8786–8802. (2002) Oxidative stress increases expression and activity of BACE in NT2 neurons. Neurobiol Dis 10:279–288. (2001) β-Amyloid-(1–42) impairs activity-dependent cAMP response element-binding protein signaling in neurons at concentrations in which cell is not compromised. J Biol Chem 276:17301–17306. (1999) β-Secretase cleavage of Alzheimer's amyloid precursor protein by the transmembrane aspartic protease BACE. Science 286:735–741. (2004) Increased β-secretase activity and expression in rats following transient cerebral ischemia. Brain Res 1009:1–8. (2003) Elevated β-secretase expression and enzymatic activity detected in sporadic Alzheimer disease. Nat Med 9:3–4. (2007) Hypoxia-inducible factor 1α (HIF-1α)-mediated hypoxia increases BACE1 expression and β-amyloid generation. J Biol Chem 282:10873–10880. (2007) Molecular and cellular mechanisms for Alzheimer's disease: understanding APP metabolism. Curr Mol Med 7:687–696. (2011) Biology and pathophysiology of the amyloid precursor protein. Mol Neurodegener 6:27.